A 23 minutes short edit with underwater footages and music. A bit in the spirit of my Cosmogony fanedit. TMBTM - LIFE lite from TMBTM on Vimeo. 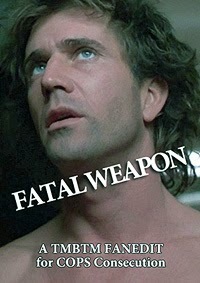 A little sad story using Lethal Weapon as a source. 13 minutes. Death Tango by TMBTM from TMBTM on Vimeo. A little mash up of "Regarding Henry" and "Frantic"/ released on the "Shut Up! Consecution" project. Everyone should think twice before making Rambo mad. Even Iron Man! IRON BLOOD by TMBTM vimeo from TMBTM on Vimeo. This short edit (12 minutes) is part of the fifth "consecution" DVD series released at fanedit.org: Marvel Consecution. Wall-e Fantasy Fanedit from TMBTM on Vimeo. "A lonely cleaning robot desires to leave the rotten earth and takes the first chance he gets." FAST BLOOD Short Edit from TMBTM on Vimeo. It is a condensed version of “First Blood”. Rambo being chased by everyone in 18 minutes.